If you are facing criminal charges, the most intelligent course of action is to hire a competent criminal defense lawyer with experience, knowledge of the law and the Ontario Court System. One of the most significant issues in criminal law defence work is the communication between counsel and client. Please contact Philip Klumak at 416-367-2690 to learn more about areas of services offered! 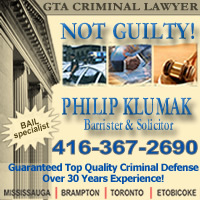 CRIMINAL LAWYER TORONTO in Toronto!